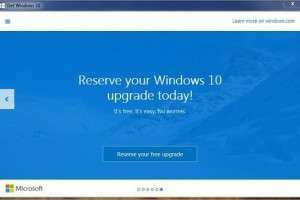 Microsoft has done something different with the release of Windows 10 and made a free upgrade available to users of Windows 7 and Windows 8. We’ve done some testing with Windows 10 and even upgraded some of our own systems in-house to Windows 10 and we think it’s a good operating system, and far superior to Windows 8. But you may have systems that don’t need to be upgraded. Perhaps your system only has drivers that were not designed for Windows 10, or you might have software or hardware that may not be compatible with Windows 10. If you will not be doing the update, this guide will help you to disable the notifications and pop-ups. When you hover over it, it says “Get Windows 10”. 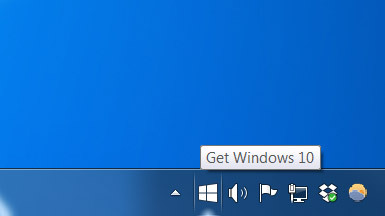 To remove this icon you need to remove the Windows update that installs the Get Windows 10 program and prevent it from re-installing the next time your system runs updates. In the left pane, click “Check for updates”. When Windows finds updates for your computer, click the “Important” and “Optional” update links. You will be looking for the update “KB3035583”. Right-click the KB3035583 update, and then click “Hide update”. The next time you check for updates, the update won’t be automatically selected or installed. Confirm any confirmation boxes that come up. Check the rest of your Windows updates and if there is anything that says “Upgrade to Windows 10” or something similar, and also hide that update. Click “OK” to exit out of the screen. and that is it! You are done!